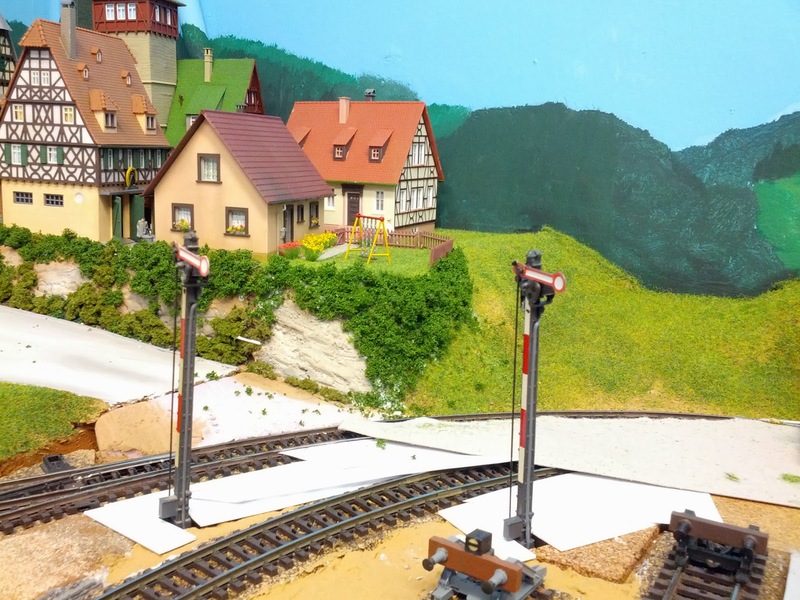 We took panoramic shots at Silicon Valley Lines today, and I used the opportunity of having a 8mm fish eye lens and a panoramic head in the house to do the same at the Welztalbahn. 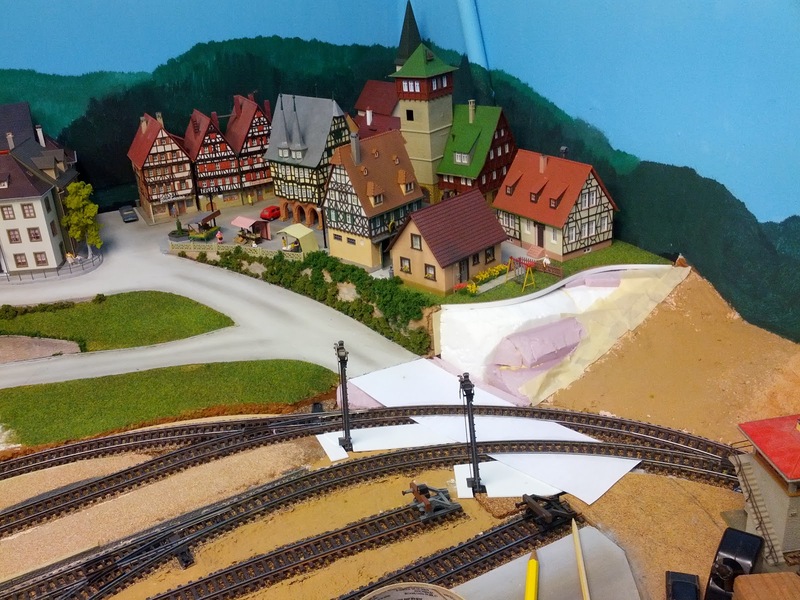 This is the panoramic view from the Emsingen operator position. I made the panorama from 4 individual shots taken in exactly 90 degrees offsets, and processed them with Hugin on Linux. Here is the full-size version of this picture. I started writing this blog over 8 years ago. This is post number 701. Congrats to me. Yay! In my last post, I had photos of the unpainted rock, but didn't describe how I made them. 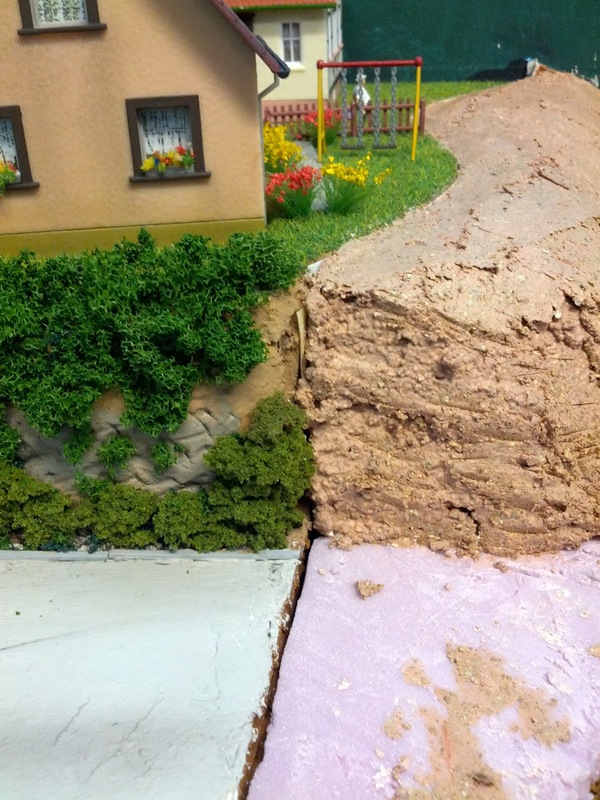 I used a mixture of Fine Vermiculite and plaster (roughly in a ratio of 5 to 4) to cover the extruded foam pieces underneath. This stuff is similar to Woodland Scenic's "Mold-A-Scene plaster". The mixture has a working time of roughly 10 minutes so I make it in small batches. I use a spatula to smear it wherever it needs to go. First in fairly broad strokes to apply the whole batch, and then I go back and smooth out where necessary (e.g. 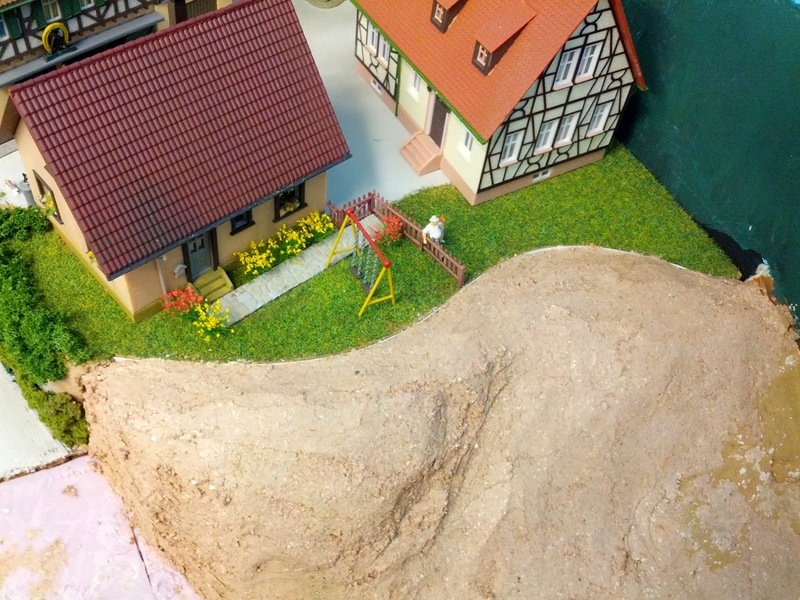 along the hill), or make it more lumpy where I want rocks. As the mixture hardened I carved out bits with a putty knife to create the weathered look of an older rock face. This creates a fairly soft looking rock, which is exactly what I needed here. The result can be seen on the right. At this time of year in the garage it takes several days for the mix to dry. If I wanted sharp rock edges, I either wait for the mixture to dry completely and then start carving, or make the rock from Hydrocal in molds. Well, actually you can tell from the photos that I got impatient and didn't want to wait for everything to dry before I work my way down along the wall, so I finished up most of the grass and left a gap near the rock face to finish later. ... I'm using cheap acrylics from Craftsmart for all my scenery painting needs. "Golden Brown" and a bit of "Espresso" is my earth color. For rocks like in this picture I use plenty of "White", a bit of "Black", and a tad of "Golden Brown" to break the stark gray and get some variation of shades. I just take a bit of the colors on the brush and mix them as I paint. If the color doesn't look right, or doesn't quite match nearby areas, I might go back to the palette and take a bit more brown, or white to shift the effect in the right direction. Sometimes I take a very little bit of black, too. The point is to mix the wet colors in place and allow slight variations of color shades. Acrylics dry quickly, so it's important to work fast. This method works quite well for me, since it forces me to keep moving forward and not fret over getting the perfect look. Amazingly enough it looks just fine with only a little bit of effort. This rock face took only a few minutes to paint, after which it looked like in the photo below. When the color has dried a bit I go back and dry brush a very light gray over the edges of the rock to create some highlights. Now I needed to blend in the rock face with the surrounding scenery. The brown area on the right is pretty steep so I carefully brushed matte medium on the brown areas and sprinkled in fine turf to give the grass more body in the next step. Next, I carefully soaked the turf in 70% isopropyl alcohol as a wetting agent, applied more matte medium, and used the Grassinator to apply a mixture of short and long grass fibers. In this case I used Noch medium green 6mm fibers, mixed with spring green and summer green 2mm fibers from Scenic Express, just like what I did for the grass nearby. I applied full strength Elmer's White Glue everywhere I wanted bushes and weeds to grow. 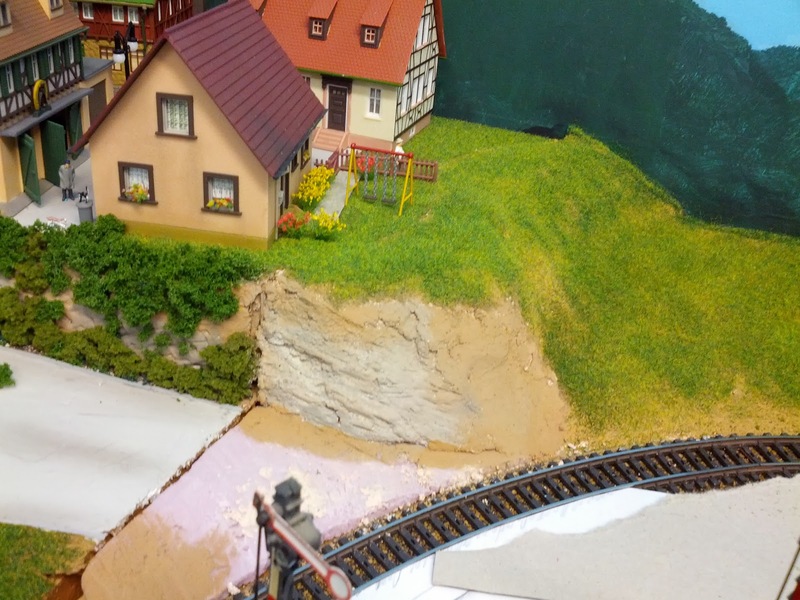 I'm using various shades of Woodland Scenics coarse foam, mostly light green, medium green, and olive, as well as lots of Scenic Express "Spring Green Super Turf". The larger Super Turf bits make nice small bushes and are excellent for overgrown weeds. I shaped the bushes to follow the edge of the hill, trying to imagine where the house owner would cut them back from above. 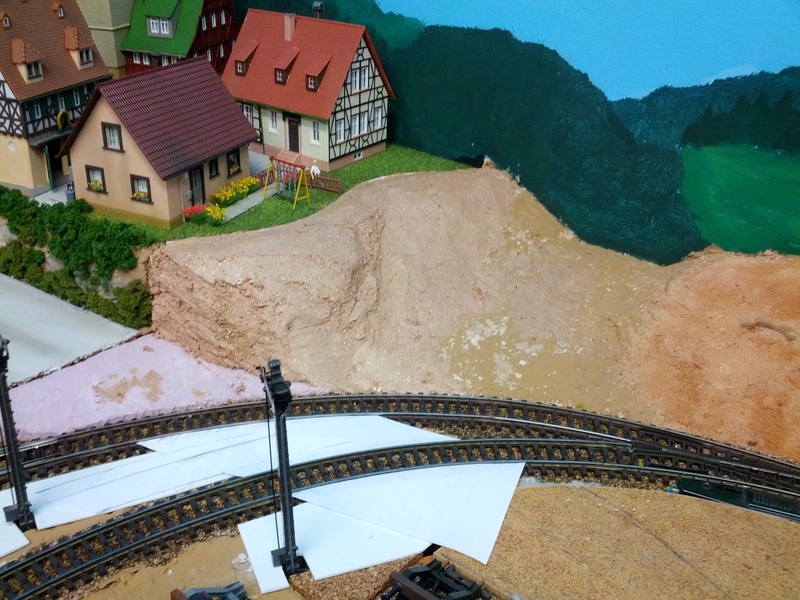 Finally, I added another piece of fence to separate the garden from the path down to the tracks, and was pretty much done. 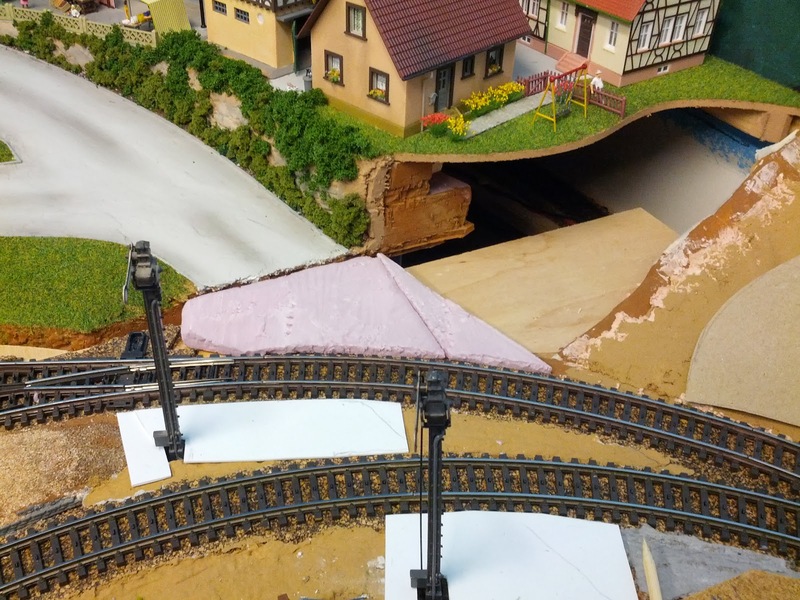 "Path to the tracks?" you say? Yes, it's not there yet, but will discuss this in another post. 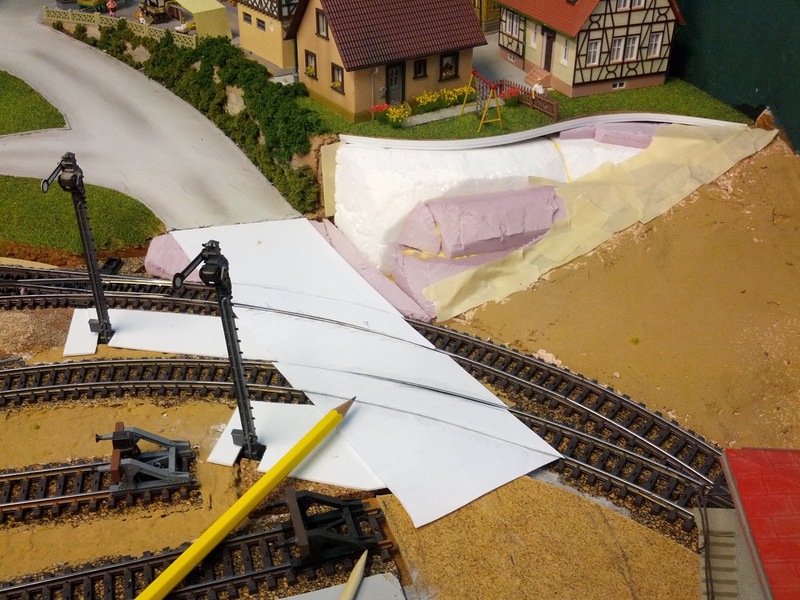 Now that he gap at the railroad crossing is closed, work has started on scenery north of Emsingen on a 3 inch wide strip between the track and the wall towards Welzbruecke and Hochwald. This will tie the northern edge of Emsingen to the already scenicked area of Hochwald. 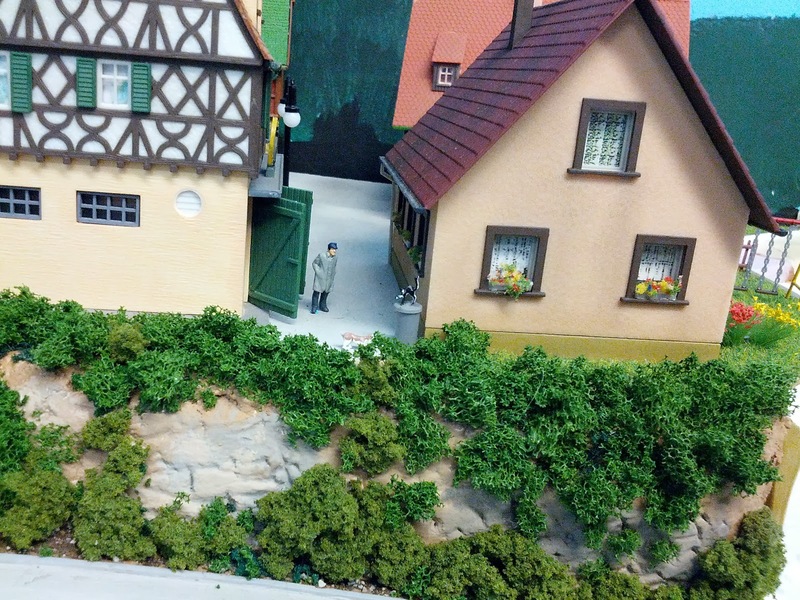 This is a fairly diverse section involving a backyard garden, the edge of a small apple orchard, unkept gras areas, a walking path, deciduous trees, bushes, a small creek with waterfall, and transition to the existing trees of Hochwald. 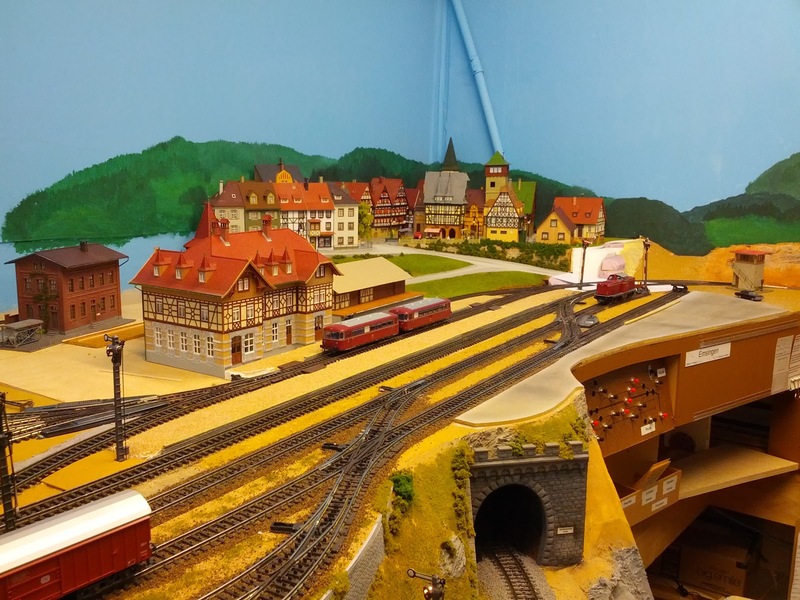 Emsingen station in the foreground. 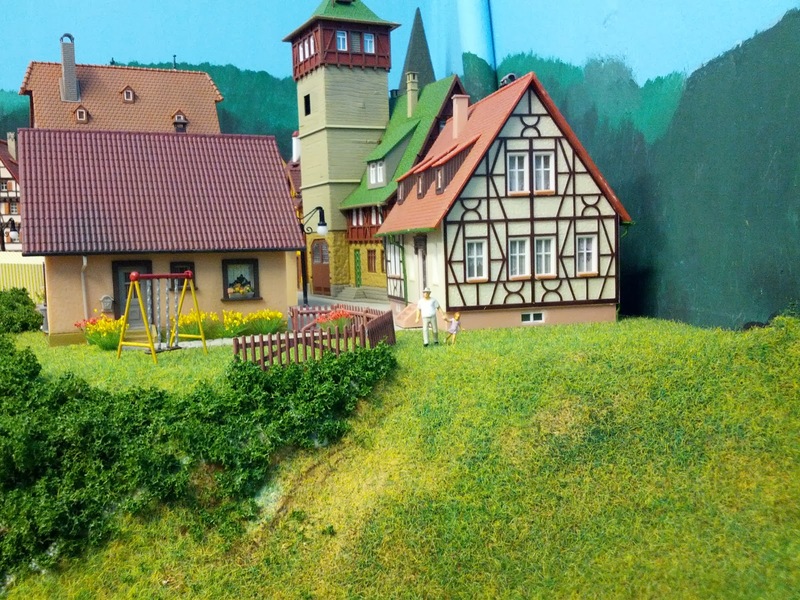 The historic town of Emsingen can be seen in behind the station. Dog and cat make for good amusement. "Fresh bananas!" -- "I'd like to try this liquor, please." 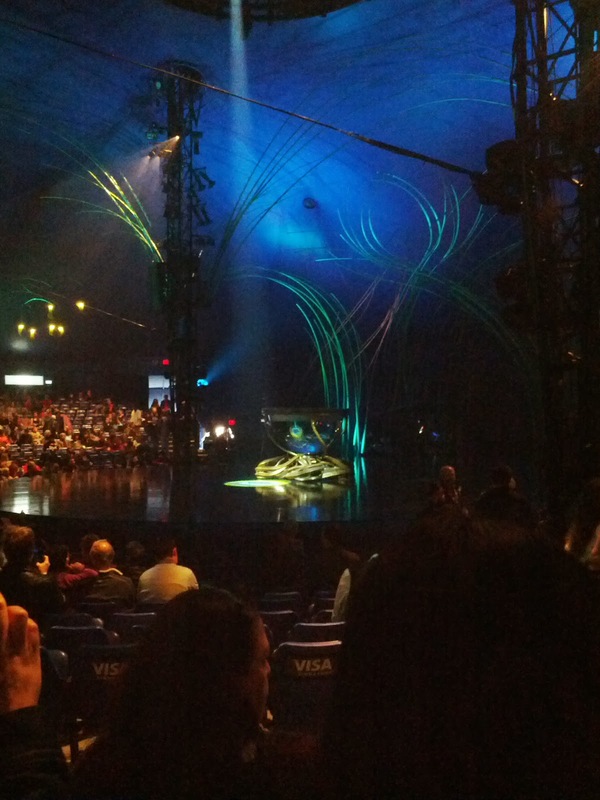 We saw Cirque Du Soleil: Amaluna today. Great show. Great artistics. Good music, too. Recommended.